As debuts go, it was about as perfect as you could imagine. Zlatan Ibrahimovic, a soccer player with a flair for the dramatic like few others, produced a Hollywood-style script for his introduction to the American audience. Zlatan Ibrahimovic, right, celebrates a goal scored in his MLS debut. Ibrahimovic has been one of the world’s most prolific soccer stars for the past decade, but he only arrived in the United States late on Thursday night. It didn’t slow him down. 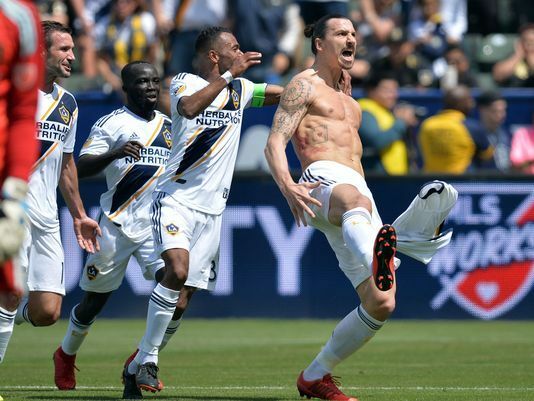 On Saturday, the Swedish superstar propelled the Los Angeles Galaxy to a remarkable comeback in its first-ever match against crosstown rival Los Angeles FC. The Galaxy rallied from a three-goal deficit to prevail 4-3. "I heard the fans chanting, 'We want Zlatan,' " Ibrahimovic said. "I gave them Zlatan." Ibrahimovic joined the Galaxy from Manchester United of the English Premier League and his late arrival meant he was kept on the bench until 20 minutes remaining. By then LAFC, in its first season as an expansion team, had powered ahead thanks to two goals from Carlos Vela and an own goal from Daniel Steres, before Sebastian Lletget struck for the Galaxy. Within three minutes of his introduction, Ibrahimovic was involved in helping Chris Pontius narrow the gap further — but the best was yet to come. After 77 minutes, the ball fell to Ibrahimovic around 40 yards from goal, on an angle. He didn’t think twice, spotting goalkeeper Tyler Miller off his line – firing an extraordinary strike over Miller and into the net. Then, with just moments left in the contest, he sealed a memorable victory and an unforgettable debut. Ibrahimovic may have been in a slightly offside position when he connected with Ashley Cole’s cross and headed home the winning goal, but the goal stood, and a new chapter to a notable career was underway. 0 Response to "Zlatan Ibrahimovic scores two amazing goals for Los Angeles Galaxy in his MLS debut"